Rooster has developed the Thermaflex fabric to provide a solution for sailors who require warmth when in the water, but coolness whilst above it. The Thermaflex fabric is manufactured from a super stretchy neoprene that is coated with Lycra for a performance top which allows a close fit with amazing stretch and temperature control properties. It can be worn under an Aquafleece or in combination with other Rooster clothing products to add an extra thermal barrier against the elements. After trialing the product with our 49er sailors – they found it ideal for flexibility and knock protection around the boat. 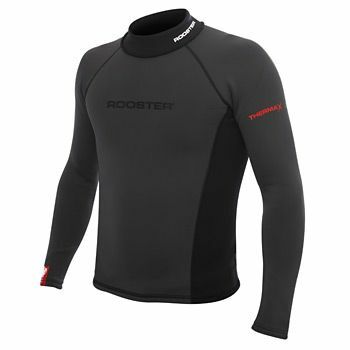 I find the Rooster layering approach really works and my favourite bit of kit is the Therma Flex top. If it's cold I wear it over a thermal rash vest and my Race Skin and I reduce layers as it gets warmer, so in summer I wear it on its own with hikers. I don't overheat with it, yet it's warm enough when I go swimming. I've also combined it with a short arm wet suit to extend it's use into December. Ultimate flexibility and it looks good too.